Thousand Oaks High School Instrumental Music Department features three concert performance ensembles: Wind Ensemble, Wind Symphony and Symphonic Band. Placement into these ensembles is determined by audition. 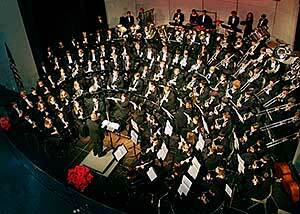 The Wind Ensemble is premier performance concert band at Thousand Oaks High School. Members of this exclusive group study and perform the most advanced literature available for band. Designed for advanced students, band members must audition during late Spring and January (percussion) each year for acceptance into this select ensemble. Instrumentation in this ensemble is usually one per part and students are seated by performance ability. The top chair in each section is the principal player and earns the responsibility to organize the needs of their perspective section. The principle player also is the soloist for any given solo that is required for the ensemble as determined by the director. Wind Ensemble section members are ranked by audition and may challenge the player in the next chair through the challenge process. During their spring season, the Wind Ensemble participates in the district band festival hosted by TOHS and any other festival scheduled by the director. This elite group has consistently earned "Superior" ratings at the festival. Non Marching Band Members of this ensemble will participate in the stands at home football games. The Wind Symphony is designated for experienced students musicians who wish to extend their training by studying and performing challenging musical repertoire. As their musical abilities mature through study and practice in the Wind Symphony, many of these student musicians will move on to become members of the Wind Ensemble. Because of the high level of musical skill required, band members must audition during late spring and January (percussion) each year for acceptance into this select ensemble. Instrumentalists in the Wind Symphony are organized by section, with each group having a section leader called the principal player. Section members are ranked by audition and may challenge the player in the next chair through the challenge process. During their spring season, the Wind Symphony participates in the district band festival hosted by TOHS and any other festival scheduled by the director. This ensemble has consistently earned "Superior" ratings at the festival. The Symphonic Band is designed for novice and intermediate student musicians who wish to extend their training by studying and performing an appropriately challenging musical repertoire. As their musical abilities mature through study and practice in the Symphonic Band, many of these student musicians will move on to become members of the Wind Symphony and Wind Ensemble. Band members must audition during late spring and January (percussion) each year for acceptance into this select ensemble. Instrumentalist in the Symphonic Band are organized by section, with each group having a section leader called the principal player. Section members are ranked by audition and may challenge the player in the next chair through the challenge process. During their spring season, the Symphonic Band participates in the district band festival hosted by TOHS and any other festival scheduled by the director.